1. Pick out costumes together: You are never too old to dress up for Halloween. Whether it’s two objects that go together like salt and pepper, or an infamous duo like Barbie and Ken, bonding and spending time with your partner in your costumes will be entertaining enough. 2. Decorate for Halloween: There is no better way to get in the Halloween spirit than by decorating your house inside and out. Spend a day with your partner making DIY crafts and finding the most frightening decorations to hang all around your home. 3. Plan a murder mystery dinner party: Host a murder mystery dinner party with your partner that your guests will never forget. Start by assigning all of your guests a role to play, one of which is the murderer. During the course of the party, your guests will try to figure out is the mystery. Not only will your party be unique, but it will be a fun way to get into the Halloween spirit with your partner and your friends. 5. Take a haunted house tour: Many cities across the country are now releasing the scariest haunted houses in your area. Go with your partner on a house tour and have a reason to cling onto each other all night. 6. Tell scary stories by a campfire: Break out the hot chocolate or adult beverage and cozy up by a campfire with your date and friends. Tell your favorite scary ghost stories; hopefully everyone will move a bit closer to their dates. 7. Carve pumpkins: Carving pumpkins has been a Halloween tradition for decades. Start by going to the pumpkin patch with your date and picking out the best pumpkins you see. From there, enjoy a nice evening relaxing and having fun carving your pumpkins in whichever way you like. 8. Go to a local amusement park: During the month of October, many amusement parks have Halloween-themed nights that can be great scary dates for you and your partner. Whether you want to just enjoy the rides in the romantic moonlight or actually get scared by the frightening decorations of the park, it will be a night to remember. 9. Go on a picnic in a graveyard: Get your blankets and food ready, and go on a picnic with your date in a graveyard. This frightening date will be sure to get you ready for October 31st. 10. Get lost in a corn maze: Many local farms put on a haunted house-themed maze where people are just waiting to pop out at you. This haunted evening gives you and your date the perfect opportunity to jump into each other’s arms. 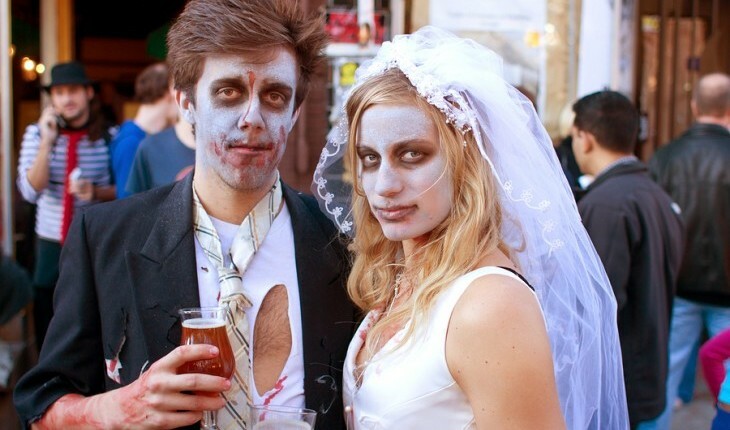 Cupid wants to know: what did you and your partner do last Halloween? Tell us in the comments below!